Kuranui College is just down the road in Greytown, and they’ve been on an ambitious updating and modernisation program for some time now. A suite of seven Science and Mathematics classrooms were completed in 2011, and 2012 will see the construction of new Visual Art classrooms. They’re also very focused on raising their educational standards and achievement levels, and the dedication over the last few years is showing dividends. Along with all their real world upgrades, Kuranui were also keen to update their online presence; their website was starting to show its age. We’ve given it a shiny new look, added extra content, and brought more clarity and appeal to the interface. Over the next few months I’m really looking forward to working closely with Kuranui staff, expanding the site and showing off all the facets of college’s exciting developments! 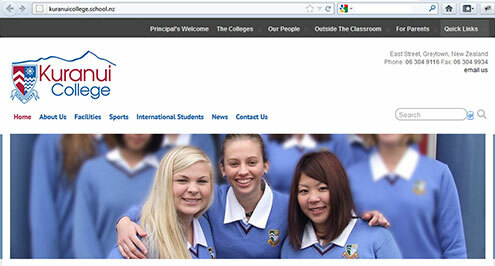 Launch the Kuranui College website.